For those in northern climates, spring heralds the promise of warmer weather and time spent relaxing outdoors. Whether it’s a backyard barbeque, an evening outside on the deck at a favorite restaurant, or taking in a concert at a local park, warm weather can be a great incentive to sit back and enjoy a slower pace of life. Of course, summer isn’t all about taking it easy. You still need to get some exercise. And what better activity than cycling? Getting on your bike and riding to the local pub, grocery store or even work can be a pleasant way to stay fit and keep your metabolism burning calories. According to researchers at the University of Washington in Seattle, riding your bike can also pay huge dividends when it comes to heart health. The research team used the words “bicycle,” “health,” “morbidity” and “mortality” to search seven major health databases. — Two randomized controlled trials of cycling to work found improvements in cardiorespiratory fitness among the cyclists. — A third study found significant increases in maximal power output and relative VO2max among the cyclists versus the controls. (VO2max is the maximum volume of oxygen you can utilize in one minute during strenuous exercise). — Many studies found an inverse association with cardiovascular disease for cycling. 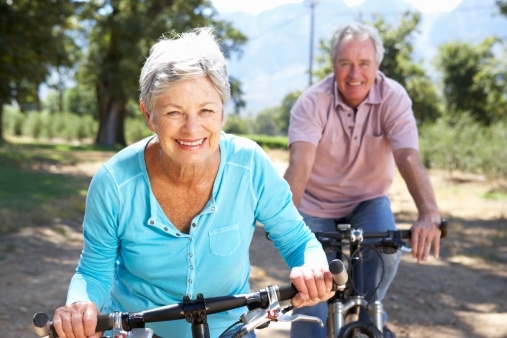 — There was a lower risk of all-cause mortality for those who cycled most (six-year follow-up). — Cardiorespiratory fitness improved in boys and girls who began cycling. — There was a significant weight loss for nurses who cycled or walked briskly for 30 minutes per day, but not for those who walked slowly. — Two studies found that school children who cycled to school had greater aerobic power, muscle endurance, and flexibility and were more likely to be in the top quartile of fitness than walkers or passive travelers. — Greater weekly duration or energy expenditure in cycling was associated with a lower risk of all-cause mortality, cancer, and specifically colon cancer. — Cardiovascular disease incidence decreased for up to 3.5 hours per week of cycling in comparison with those who neither cycled nor played sports. Not a fan of cycling? Try these types of exercise instead to boost your health.